Women skirts are in fashion and are loved by Muslim women as the outfit is comfortable, stylish yet modest. 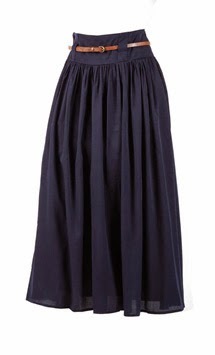 Long skirts can be worn to offices and even to formal or informal occasions. Wearing your skirt in the right manner can make you look elegant and trendy. Here are some styling tips that will help you look even more fashionable. Choose skirts that fall smooth from the waist: Some skirts fall smooth from the waist while some are gathered at the waist. The bunches of fabric around the waist will make you look heavier. While choosing a skirt, always choose a skirt that does not have any fabric gathering on the waist. Color tone: If you are thinking of wearing a skirt for the first time, it is better to opt for solid colors. Do not be experimental at the first go! If you do not want to wear a plain skirt, choose a skirt having a subtle print and team it up with a top of the same color as that of the skirt. Always keep it simple – do not choose skirts or tops of large prints. Choose cotton skirts: Choosing a long and loose skirt is the right choice, but at the same time you must pay attention to the fabric of which the skirt is made. While wearing a skirt, you might go to a breezy place and this is when you need to carry off your skirt elegantly and carefully. Cotton skirts that are loose yet fit in such a manner that they do not get blown by the breeze are an ideal choice for every woman. Appear taller with high waist skirts: Not many people know, but choosing a high waist skirt gives the wearer a taller look. The surprising fact here is that even if you pair a high waist skirt with flats, you will appear tall.